I lose track of time while running on trails. The sight of birds zipping through the understory and the discovery of a coyote’s paw print on the trail always make me forget about the ticking clock. The fragrance of trailside wildflowers has the curious effect of releasing my mind from schedules and obligations. When running on city streets, on the other hand, I find it harder to acquire mental solace. Instead, I watch the minutes creep by. Getting lost in the moment is just one reason why I prefer trail running to road running. Here are a few other features of trail running that make it an activity I always look forward to. It has less of an impact on the body, thereby minimizing injuries and recovery times. You don’t have to contend with car traffic and all that goes with it, including stoplights, crosswalks, and driveways. The wildlife, plants, trees and the natural landscape provide a welcome break from the ribbons of concrete. It allows a temporary escape from the enormous crowds of people who inhabit Chicagoland (nearly 10 million at last count). Running on an uneven surfaces creates better balance and strengthens more muscles in your feet and legs. What makes a good running trail? As someone who’s hiked and jogged all the best trails in Chicagoland (and many more trails throughout Illinois), you could say I’m a connoisseur of good trails. Here’s a list of features I look for when choosing a good running trail. Accessibility. The best trails are the ones close by. If the trail is situated close by, you’ll use it more often and you’ll cut down on time spent in transit and the use of cars and gas. If you can reach the trail without getting behind the wheel of a car, all the better. I’ve used my bicycle and I’ve taken Metra trains to reach trails in parks and forest preserves. Adequate length. Look for a trail system at least a few miles in length. If you must cover the same ground on a single run, so be it. It’s still better than pounding the pavement. Good maintenance. The best trails are ones that drain well (fewer puddles and less mud), and they are well marked with trail signs. Look for trails where erosion problems are quickly fixed and fallen trees are removed. Variety. While it’s not always possible, I like to run and hike on trails that offer different types of landscape and vegetation. Shifts in topography and plant life means you’re more likely see different types of animals and insects, too. The right level of difficulty. Most of the trails in the Chicago region offer a low level of difficulty thanks to a smooth trail surface and gentle terrain. Still, occasionally, you’ll find trails that offer more of a challenge because of rocks, roots, sand, and water ruts on the trail surface. Trails with hills and a sandy surface (such as those mentioned below at the Indiana Dunes) present a higher level of difficulty. Where are the best running paths in the Chicago area? While the Lakefront Trail in Chicago is a paved path, it offers long sections of gravel side paths throughout the 17-mile length. Expect loads of trail traffic on the northern half of the trail. The Palos/Sag Valley Forest Preserve contains about 30 miles of trails, most of them topped with a smooth, crushed gravel surface. The forest preserve contains a growing network of singletrack trails; these must be shared with a steady stream of mountain bikers. The Indiana Dunes in northwest Indiana offer superb running destinations for those who want a thorough workout. Both the 12-mile-long Li-co-ki-we Trail the 4-mile-long Cowles Bog Trail have surfaces that are mostly sand. The I&M Canal Trail is a wide, crushed gravel path that runs for more than 60 miles from the outskirts of Joliet to the town of LaSalle in the middle of Illinois. Runners looking for many miles of remote ambiance will be thrilled. Goose Lake Prairie State Natural Area contains one of the largest remaining tracts of prairie in the Prairie State. Expect plenty of wildflowers along nearly 6 miles of unshaded trail. Danada and Herrick Lake Forest Preserves contain about 8 miles of wide, crushed gravel trails that lead you through through a gentle, wooded landscape. 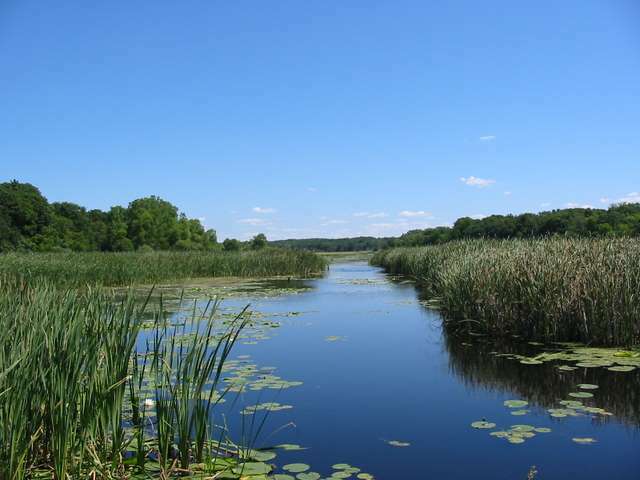 Blackwell Forest Preserve offers about 5 miles of trails that run through serene wetlands, prairie, and woodland. Take a training tip from the former Chicago Bears player Walter Payton and use the park’s big hill for an ultimate running workout. Enjoy groves a stately oaks and quiet twisting streams in Green Valley Forest Preserve. Keep an eye out for equestrians along the park’s 4 miles of wide, crushed gravel trails. The Illinois Prairie Path comprises about 30 miles of wide, crushed gravel pathway in the western suburbs. If you live in one of the communities along this path, you know it’s a favorite destination for local runners. Deer Grove Forest Preserve contains an array of ponds and wetlands mixed in with thick fairytale woods. Expect about 8 miles of trails within this wooded oasis. Des Plaines River Trail runs for about 31 miles between the south and the north boundaries of Lake County. The wide, crushed gravel trail follows a string of eye-catching forest preserves that line the banks of the Des Plaines River. Moraine Hills State Park is big, varied, and persistently beautiful. Follow a series of trail loops for about 8 miles through wetlands and around a lake carved out by a receding glacier. Chain O’ Lakes State Park contains more than a dozen miles of trails that run through all types of landscapes: prairie, river bank, woods, wetlands, and savanna. The west side of the park is rugged and less visited. The east side offers a gentler landscape with picnic areas and campgrounds. Navigation. Until you get to know a trail system, consider bringing a map. If you don’t have a map and are unfamiliar with the trails, you might try the “left turn strategy.” Simply keep turning left. This allows you to find your way back to the trailhead by turning around and taking right turns. What to bring. Along with a map, some joggers like to hit the trails with an energy bar, water, and a cell phone. Depending on the time of year, you may want to bring a light jacket. Trail etiquette. When trails get busy, knowing the ins-and-outs of trail etiquette becomes essential. Stay to the right and give slower trail users the right of way. If stopped, remember to step off the path. Keep the volume turned down on your ear buds. If the trail is busy, leave the ear buds at home. Never run more than two abreast. Personal safety. Very few violent incidents occur in Chicago-area forest preserves and state parks. Some ways to enhance your safety on the trail include bringing a friend (human or animal), bringing a cell phone, and visiting places where you’ll see plenty of other people. Also, you may consider hitting the trails early in the day and contacting the park staff to ask if incidents have ever occurred in a particular park. Run Too offers a nice collection of local running links, including a list of good local trails for running. For those who want to get involved in competitive trail running, check out the Chicago Trail Series. Want more information about the destinations listed above? Check out my books 60 Hikes within 60 Miles: Chicago and Best Illinois Rail Trails. Also, you can check out the photos I’ve posted for many of the destinations listed above. The following article first appeared in the May 2010 issue of Competitor Chicago magazine. Thanks to the magazine for allowing me to post the article here. Ten feet above my head, a single swallow twirled through the air, every so often dipping down to skim the water in front of my sea kayak. After spraying a bit of water along the surface, the little bird flapped feverishly to regain its former position above my head and start the process again. Getting a drink of water on a warm summer day never looked so fun. I was paddling a dozen miles on a mid-section of the Fox River as it flows through the western suburbs of Chicago. I decided to launch in Elgin and pull out downriver in Geneva because both cities contain Metra stations, allowing access to and from the river with my 13-foot folding sea kayak. The kayak and all the necessary gear stuffs into a large backpack that weighs about 45 lbs. The Fox is a wide, slow-moving river. Multiple dams keep the water moving at a sluggish pace, often creating the feel of a long lake rather than a moving river. Some paddlers find lazy rivers like the Fox boring because the only navigational imperative is to keep yourself from drifting into the private docks and colliding with the occasional motorboat whizzing past. As someone who typically prefers paddling narrow, fast rivers that run through woods and countryside, I was surprised by how much I enjoyed the Fox’s calm, steady flow. It provided an opportunity to decelerate, let my thoughts wander, and enjoy a day of dawdling. My lazy river vanished when the wind picked up, causing small waves to splash over my kayak’s bow. The wind blew north while the river flowed south, canceling each other out. When I stopped paddling, I remained stationary or started drifting toward shore. The wind relented as I approached the first portage. To get around the 8-foot dam in South Elgin, I pulled the boat up a small embankment of rip-rap, over a guard railing, and then dragged the kayak 75 yards through Panton Mill Park. After lounging in the park and filling up my water bottle, I rejoined the river and soon glided past another park—this one containing a collection of old trolley cars on display at the Fox River Trolley Museum. A steady stream of cyclists cruised up and down the Fox River Trail. The current quickened as the river threaded its way around a cluster of islands, most of them wooded. One was just a sandbar where someone had installed a birdhouse high on a steel pole. After passing through the supports for a pedestrian bridge for the Fox River Trail, the river runs between two forest preserves. Red oak, silver maple, and occasional willow trees decorate the banks of John J. Duerr Forest Preserve on the right and Tekakwitha Woods on the left. Kingfishers chattered from nearby branches; turtles plopped off logs, and patches of tiger lilies grew on islands mostly covered with floodplain forest. From where the river makes its famous hairpin turn, the banks intermittently expanded and contracted for the next four miles to St. Charles. Wooded bluffs accompanied the river for much of the way. When the woods receded, river houses sat shoulder to shoulder, often with inviting waterside decks and nearby motorboats perched on metal stands. For the moment, I was relieved that the huge fleet of ski boats and beer boats sat idle along the shore. At Norris Woods Nature Preserve, a sandy patch of shoreline in the shade of silver maples offered a good location to take a break from the river, stretch my legs, and eat lunch. It was heading toward late afternoon when I returned to the river only to discover the motorboats were alive and well, and now using the river as a drag strip. A couple of the boats hauled kids around in big inflatable donuts; others were out for scouting fishing or swimming spots; and some boaters were simply joyriding the length of the river. Within this last category, the most puzzling development was the guy on the WaveRunner who passed me at 5 minute intervals, throttle fully open, the engine screaming. He sped downriver and then headed back up, down and then back, again and again. I wondered if something was wrong with him, like a record that keeps skipping. Arriving in St. Charles, a big paddleboat containing two decks of passengers rumbled upstream. I pulled my kayak out of the water at the back door of the St. Charles Police Department—about 50 yards before the 10-foot drop of the dam that marked my second and final portage. Rising up next to the dam is an Art Deco-style white marble municipal building with an 84-foot octagonal tower. A quick glance downriver revealed that a construction project next to the municipal building prevented access to the regular launch site just below the dam. After seeking advice from the police department staff, I scouted an alternative put in that required a one-half mile walk downstream. Hauling my fully assembled boat that distance would be grueling. The steady wind would have made it exceptionally awkward to carry it on the narrow sidewalks and across Highway 64, which was mind-bogglingly busy with afternoon commuter traffic. Fortunately, folding kayaks shine in situations like this. In 10 minutes, I knocked the boat down, stuffed it in its backpack, and started walking to the new launch site. No surprise that the river grows quiet between St. Charles and Geneva—the distance of less than two miles between the dams in each town means fewer homes and fewer people using the waterway. Water birds seemed to prefer this serene stretch of river: herons appeared more frequently, as did geese and ducks; cormorants showed up for the first time, and I’m nearly certain an osprey, rarely seen in the region, briefly soared overhead. Gravelly banks create spots to pull out. This small slice of the Fox proved to be more welcoming than I expected. I thought I’d quickly grow impatient with the river’s lackadaisical progression. Instead, it allowed me to fully relax while watching tree branches brush the surface of the water and listening to fish jump on the opposite shore. A slow river leaves more time to feel the pull of the water as it gently carries you downstream, around bend after bend, over ripples, crosscurrents, and eddies. In Geneva, 12 miles of easygoing paddling behind me, it was time to disembark for the day. Returning the boat to its bag, I strapped it on my back and started a one-mile walk to the Geneva Metra station to catch a train back to the city. In some ways, the Fox River is a great option for beginning paddlers: it’s wide, slow, shallow, and numerous parks offer spots where paddlers can pull off. Not so great for beginners are the frequent portages around dams and the number of motorboats on some sections. The river’s slow-moving current allows for a type of paddling trip unheard of on most rivers: out-and-back excursions. Rent a boat: Geneva Kayak Center, the most extensive kayaking store in the region, is located at the take-out point in Geneva: 34 North Bennett Street, Geneva; (630) 232-0320. Will pick up and drop off the boats for you. Decide when to go: Many stretches of the Fox can get busy, particularly on the weekends; consider paddling during the week. You’ll find more solitude earlier in the day. Ask local outfitters about water levels. Some sections of the Fox—between Geneva and Batavia, for example—tend to be very shallow during low water. Know the dams and portage spots: Openlands publishes maps showing the dams and portages. Local outfitters will know if portages are clear. Construction will be finished on the St. Charles portage in spring 2010. Be very cautious while paddling near the dams. Fatalities have occurred in recent years at dams on the Fox River. The trip is now in the bag. Folding sea kayaks serve as the perfect solution for apartment dwellers who have limited space for storing a sea kayak. They’re also great for the traveler with an urge to paddle and people who like the idea of car-free paddling trips. Manufactured for the past century and then overtaken in the 1950s with the introduction of fiberglass kayaks, folding Kayaks look and feel much like the original sea kayaks developed by seal and walrus hunters of Alaska, northern Canada, and Greenland over the course of 4,000 years. A boat-in-a-bag will tend to be more expensive than the average polyethylene kayak, but it likely will have a longer lifespan and more stability in the water. With a minimal amount of upkeep, folding kayaks are surprisingly durable. Their sturdiness was demonstrated as far back as the 1950s when a German man crossed the Atlantic Ocean in a standard 17-foot Klepper folding kayak. Not quite built for crossing an ocean, my 13-foot boat is better suited for inland water and Lake Michigan on a calm day. With a little practice, I can put together my Feathercraft K-Light kayak in 15 minutes. The heavy-duty nylon and rubber skin fits over a frame of aluminum poles. Instead of airtight bulkheads used in the typical sea kayak, inflated bags inside the folding kayak maintain buoyancy in case the boat gets swamped with water. Folded up, the boat fits inside a bulky but very manageable backpack that I’ve hauled into taxicabs, onto trains and buses, and on a trailer pulled by a bicycle. My friend Kari Lydersen recently interviewed me for a short piece for the Great Lakes Town Hall, a website where she served as a guest writer. She wanted to learn more about a trip I took in August bicycling the west coast of Michigan. As I explain below, for much of the trip, I was hauling my folding kayak with a bicycle trailer. After reading the interview, be sure to check out Great Lakes Town Hall. It’s an excellent website with plenty of news and views on the Great Lakes. My kayak awaits assembly on North Manitou Island. Q: How exactly did you travel by kayak and bike down the coast of Lake Michigan? The idea for the trip was to combine a couple of my favorite outdoor activities–cycling and kayaking–while exploring some of the west coast of Michigan’s lower peninsula. For much of the trip, I was hauling my sea kayak (it folds up into a suitcase-sized bag that weighs about 35 lbs) behind me in a bike trailer. I stayed as close to the shoreline as possible and camped most of the time at the numerous parks along the way. I started the 10-day trip by paddling around North Manitou Island off the coast of Sleeping Bear Dunes. From there, I bicycled my way down to Muskegon, stopping frequently for paddling, lollygagging on beaches, bike rides and exploring parks and towns. When I reached Muskegon, I took the ferry to Milwaukee and then rode home to Chicago. Q: It was a windy and stormy few weeks; how did you deal with the weather? Were there times you wanted to be comfortable and dry at home? Sure, there were a handful of times when I would have liked to be home on the couch. I’ve learned that having a fairly loose itinerary helps a lot. That way, you don’t feel compelled to push yourself to ride or paddle through conditions that may be uncomfortable, or perhaps dangerous. Since I was paddling by myself, I took a very cautious approach to paddling in the lake, and avoided it if lake waves were more than one foot. During the trip, it rained three days or so and a couple nights. Fortunately, for a couple of those days, I was able to forgo campgrounds and stay in an affordable little motel right on the lake. I had stayed in the motel on my prior travels in the area. It’s located in a village called Arcadia, just 40 miles southwest of Traverse City. There are big beautiful dunes, excellent beaches, and a recently opened nature preserve with miles of hiking trails. And surprisingly, no tourism to speak of. That’s the beauty of this area–unbelievable natural beauty and, if you look for it, plenty of places where you can have a beach or a towering dune all to yourself. One evening while in a state park campground during pouring rain, instead of setting up my tent in the rain, I decided to sleep under a picnic shelter. I was nervous when the park’s cleaning crew visited the shelter in the early morning, and thought they might have some harsh words and even call the police. Instead, they wanted to hear about my trip and were eager to offer advice for the next leg of the journey. It’s a perfect example of how welcoming people tend to be toward those traveling on a bicycle. Q: Do your travels like this show people can explore the Great Lakes region even without a car or lots of money? How lucky we are to live on the Great Lakes! All this beauty so close to home presents a strong invitation to explore. As the author of a handful of outdoor guidebooks focusing on Illinois and the Chicago area, I feel like part of my job is to convince people that the Midwest and Great Lakes region offer some wonderful places to visit. The famous parks of the nation are great to see, but how often can you do that? How often can people on a budget do that? Michigan and much of the Great Lakes region is pretty well suited for bicycle travel. Plenty of quiet, scenic roads. Towns and parks appear frequently. Plenty of hills that are manageable on a bike. A minimal number of big urban areas to navigate. That said, I’ve learned to beware of heavily trafficked roads. Several years back, my brother and I bicycled around Lake Superior. Ninety percent of the route was great, but in a few places we were stuck riding alongside heavy truck traffic on the Trans Canada Highway with no alternate routes. I like how traveling on a bicycle cuts expenses substantially. I also like how it puts you fully into the setting. Taking a vacation on a bicycle makes me think about things differently. I think about time differently because, of course, the pace is slower. I think about the wind, the sun, the landscape, and the plants and animals more fully. Having grown up in west Michigan, I had traveled this coast perhaps a dozen times. So I wasn’t expecting to discover much that was new to me. I was wrong. While cycling and paddling, I got to know the water and the terrain much better. Q: You said you enjoyed traveling alone, why? I like traveling alone because I find that people feel more comfortable approaching a solo traveler. For me, a big part of the thrill of travel is meeting people from the area. I also find that I feel more compelled to strike up conversations while traveling solo. Traveling by myself, I sometimes get a little desperate for conversation–and need something to distract me from my own thoughts. I also want to learn about the area. To do this, I’ve become adept at finding people who don’t look like they’re in a hurry and asking them for directions, asking about local history, and just striking up idle chitchat. Q: What is your favorite spot on the Great Lakes, why? Pictured Rocks National Lakeshore on the south shore of Lake Superior. Years back, I paddled and camped for several days along Pictured Rocks, and was transfixed by the colored cliffs, waterfalls, and beaches. While paddling the shoreline, you can see house-sized boulders within the strikingly clear water. It looks like the ruins of a sunken city. A remote ambience adds much to this place. Lake Superior has always held a special place for me–I’ve been camping on its shore since I was child. In second place is the Chicago shoreline. Instead of the sandstone cliffs at Pictured Rocks, the cliffs in Chicago are skyscrapers. The shoreline offers some 20 miles of parkland in the shadow of the most enormous and arresting buildings in the world. I love the Chicago shoreline because it’s where the city comes together; it’s the city at its best. Fortunately, the city has begun embracing the shoreline more fully, making it more accessible and giving it proper status as the city’s front yard. The page where the interview appears is here. Prairie Fever is powered by	WordPress 3.5.1 and delivered to you in 0.201 seconds using 22 queries.